Dog wound care information can be useful in emergencies especially if you plan to participate in field events. Find out when to look after dog wounds at home and when to ask a veterinarian for help. 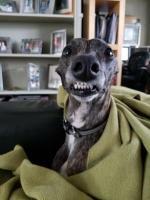 Whippets and greyhounds don't have naturally protected skin and they are more prone to lacerations than other hounds. Nevertheless, most small lacerations heal quickly and without consequences when kept clean and dry. In case your dog gets wounded, first of all asses the situation. Then check the options below to decide the appropriate course of action. Here you can download a printable version of this page to keep with your complete first aid kit. Generally the cuts sustained at field events are not very deep. If the cut is bleeding, apply pressure with a clean cloth for 5-10 minutes but if the bleeding doesn't stop, look for the nearest veterinarian for assistance. Don't use a tourniquet to stop the bleeding. 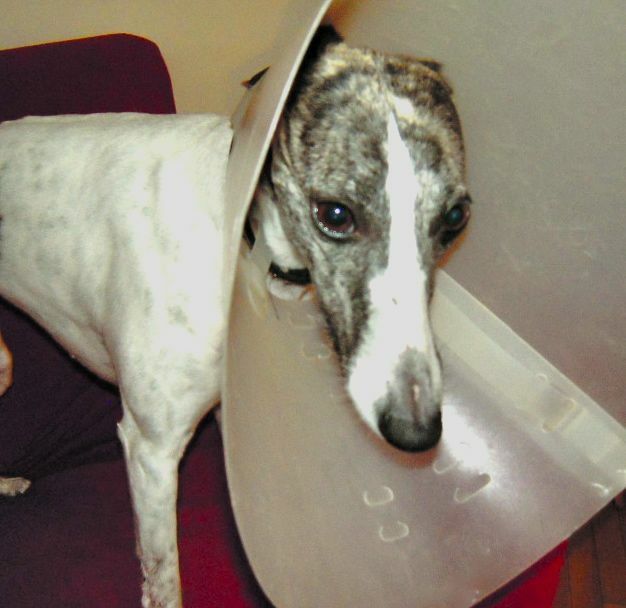 It can cause such a severe damage to the slim hound legs, that amputation may later become necessary. Flush the dog wound with abundant saline solution if available and if not, use tap water as an easy accessible alternative. Don't use ointments that keep the injury moist and can slow the healing. Also hydrogen peroxide is not of great help because it kills the cells and slows the healing process. If possible, keep the wound uncovered to let it dry. To promote fast healing it is now available Vetericyn, a topical solution for skin and dog wound care. The active ingredients are oxychlorine compounds and hypochlorous acid (HOCl) that contribute to the destruction of bacteria. Vectericyn doesn't burn, sting or stain, it is non toxic and is safe for animals of all ages and species. It is so gentle that it can be used around the eyes and mouth. This spray can be used to clean, remove debris from dog wounds without harming surrounding healthy tissues. If the cut is large it may need stitching to speed up recovery. Ideally the wound should be sutured within two hours of the accident. If the wound is deep, try to put the edges of the laceration back together the best you can, wrap it up and get as soon as possible to the veterinarian. Although superficial cuts require only simple measures, dog bite wound care may be altogether a different story. Dog puncture wounds, especially if caused by a bite are susceptible to bacterial infections and they can easily form an abscess. An abscess is a kind of pus bag that traps the infection under the skin with the risk of a general infection. Your vet may decide that the placement of a drain or surgical debridement are necessary. Normally it is safe to let your dog lick the wound, the mechanical cleaning action may even speed up healing. But if there is a suture, your dog can remove the stitches with continuous licking and biting. In this case, to avoid damage it might be necessary to use an anti lick or e collar, a kind of plastic cone to put around your dog's head.